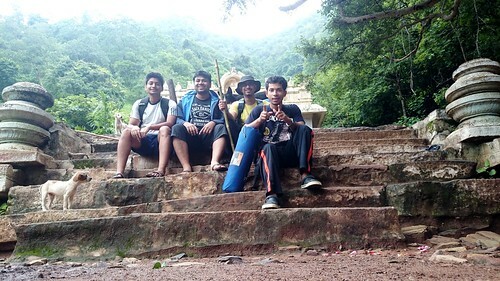 We had trekked up the Ugra Stambha, the highest peak in Ahobilam and the Sun was setting down in the Nallamala Forest when we reached Jawala Narsimha, one of the 9 temples dedicated to Lord Narsimha in Ahobilam. And, we needed to camp. Quickly. We trekked back to Malola temple where we had observed some flat ground and a flowing water source. The place looked like any other in a forest where trees and more trees were around us, and the occasional unfamiliar sounds. Most of the pilgrims had already left the place as no accommodation was available in the area. There was an abandoned hut (appeared so) near the area from where an axe, a utensil and some wood we obtained. Also, there was a tree nearby from which a saree hanged- just stating the facts! The tents were out and pitched, about 2m apart. There was a boundary-less cliff near our tents but I made sure to not pitch facing that direction. We were almost pitched below a huge tree, and a hole in the ground was located close by. We brought some large stones and had it covered. With the tents pitched, and us dried and settled, the next concern was lighting the camp fire. Having just rained, we were unsuccessful in locating dry wood, and down the drain went the idea. Rest of us: It’s okay. Arka: I will go into the other tent(hardly 2 m apart, we were in the same tent then) if you don’t stop. Rest of us: Okay, go. Arka: I can’t, I can’t go alone. Bhaiyya, Darr lag raha hai. Poor fellow Arka got too scared that we stopped after a while. It was dinner time very soon for us and with no fire to cook the Maggi we had been carrying for our dinner, we had to eat it raw, forcing ourselves to swallow it down. 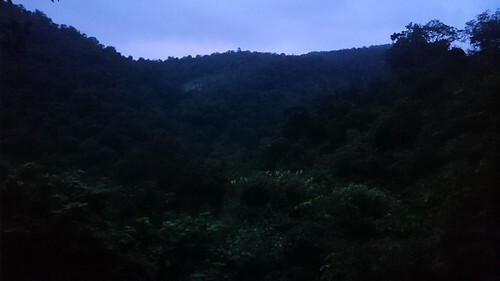 Leaving for the other tent to crash for the night, we saw the darkness illuminated by a zillion fireflies! I and Arka ended up in the same tent in which I was and he had been too scared to mum even a word. He was probably carrying his swiss knife, a torch, a stick, a lighter, and many other things in his hands before he lied down. I had fallen asleep for some while only when I dreamt of somebody outside and Arka opening the tent to find out who it was. I asked Arka in my dream who it was but actually mumbled it loud for him to hear. The otherwise scared Arka became too terrified of this and said, “Don’t kid with me”, but actually I was not. And then after some while…noises came. The puppies had again started making sounds and so did their mom. I had woken up to realize the time was exact 12 of midnight! Fear was there, of course, but I started processing things and analyzing. The puppies whom we had treated nicely in the evening won’t be turning against us in the midnight. So, it was clear that somebody/something unfamiliar had come. Or, that they were hungry. 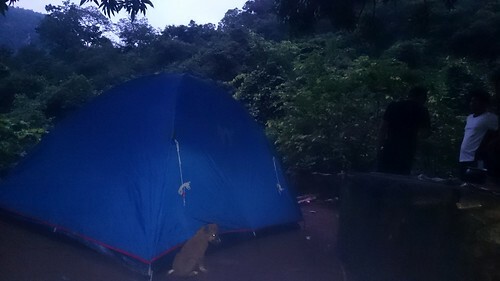 Arka and I made no sounds, though we could hear some from the other tent implying Gopal and Prateek were also up. For 1 complete hour they barked and we couldn’t and didn’t do anything. Sleep enveloped me once again after the incident, I can’t say the same for Arka though. It was a cold night but the tiring trek of the day made me numb to everything else. It was a frightening experience, sure but you do need kicks like these from time to time! ¶¶In Kawal Tiger reserve…on Bike??? The beauty of this place took us all by surprise right from our arrival! 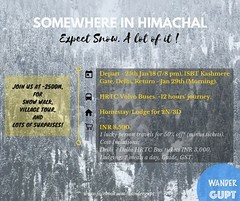 It’s an amazing one, and so close to Hyd but people hardly know about it! 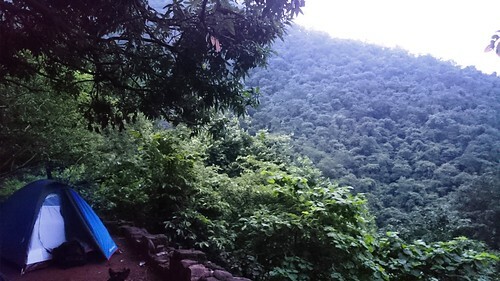 Oh…what a camping night in the jungle…I can feel the thrill 🙂 Nice post! Jatin, very thrilling experience. But, we five are planning to camp at ahobilam, is there any restrictions by the forest department? If, not which would be an alternative place for camping. Yes, the forest department forbids you to camp in the jungle. 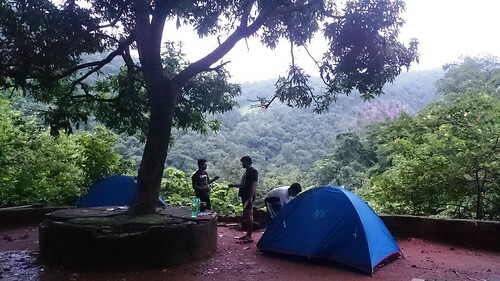 I don’t think there is any well suited place for camping in Ahobilam. 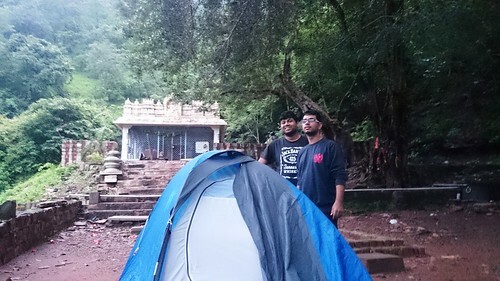 If you really want to camp, you can camp in front of the dharamshaala at Lower Ahobilam Temple after taking permissions. Otherwise, you can go ask the priests at Paavana Narsimha temple to stay in the temple for the night if other people also stay there. Surrounded by forest and mountains, Paavana Narsimha temple would be a good place to spend the night. Seems like a cool trip, Jatin. Read all the posts and enjoyed reading them. Ohh, here is one for you: While browsing photos in my phone, I saw a pic of me sleeping in my house on my bed. I live alone.